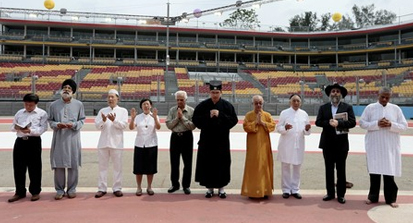 Seen here are various representatives from faiths in Singapore, gathering for prayers for peace and racial harmony – Includes Bahai, Sikh, Islam, Christianity, Jainism, Taoism, Buddhist, Zoroastrian, Jewish and Hinduism. Mr Gurmit Singh (2nd – Left) representing the Sikh faith. Copyright 2017. Sikh Advisory Board, Singapore.